Who and what gained the most from Tuesday's announcements. Apple’s media event Tuesday in Chicago was unique, from the venue to the laser focus on a single topic to the lack of a live video stream. But like all Apple media events, some parties walked away strengthened–and others were left looking sad by the side of the road. Here’s a look at the winners and losers from Tuesday. The iPad. Apple hasn’t always shown the kind of love for the iPad that it has done for its much more successful cousin the iPhone, but this day was the iPad’s day to shine, and that’s an important day in any product’s life. The iPad has gained momentum since Apple split the product line in two, and both the $329 iPad and the pricey iPad Pro models have seemingly sold well. Apple’s cheapest and most popular model didn’t just win by being the center of attention, though. It also picked up a sixth-generation update that included a faster processor and, perhaps most importantly, support for the Apple Pencil. With that, the iPad became a platform for a collection of sketching and notetaking apps that will make it that much more versatile, whether you’re a student or not. Teachers and students. 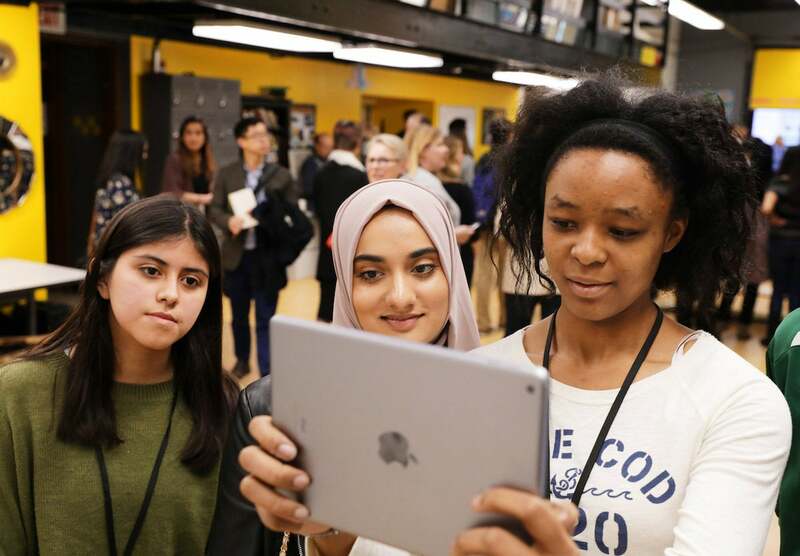 Apple’s hourlong event, and the hands-on sessions at Lane Tech College Prep High School, were love letters from Apple to teachers and students. 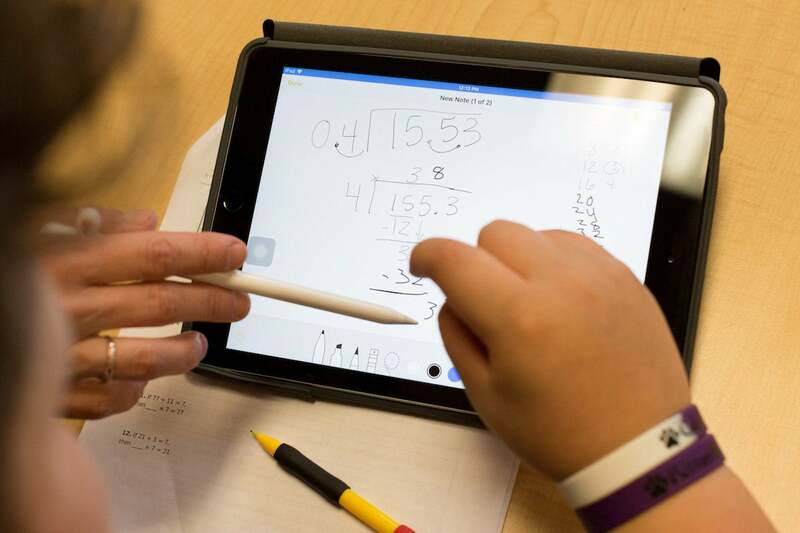 Among the product announcements, teachers got a collection of new tools to better administer their classes, and students get to benefit from advanced augmented reality features as well as the Apple Pencil. Chicago. Since Macworld Expo left New York City in 2003, Apple has held only one major media event outside of the San Francisco Bay Area: the 2012 unveiling of iBooks Author in an education-themed event in New York City. That all changed when Apple invited hundreds of members of the media and VIPs to Lane Tech. In addition to showing off the city’s impressive public magnet school, Apple’s event spun off additional events, including an all-star session at the brand-new Apple Store in Chicago’s Loop, as well as a Tim Cook sit-down with Recode’s Kara Swisher and MSNBC’s Chris Hayes on Wednesday. Apple Pencil. Once the domain of the iPad Pro, the $99 Apple Pencil ($89 for education!) is now open to owners of the low-cost sixth-generation iPad. This should dramatically expand the user base of the Pencil, which is good news not just for it, but to the app developers who have written Apple Pencil-enhanced software. By being available on the sixth-generation iPad as well as both iPad Pro models, the Apple Pencil continues its march toward the mainstream. Logitech. In a partnership that dates from the early days of the iPad Pro, Apple continues to partner with accessory maker Logitech to build products that Apple wants to exist, but not necessarily enough to build itself. This time around, Logitech not only provided a redesigned rugged case for the new iPad, but an intriguing $49 accessory called the Crayon, which is basically a low-cost Apple Pencil that lacks pressure sensitivity, but otherwise takes advantage of the same tech that’s in the Apple Pencil. That’s quite a coup–and it’s a product that’s likely to be a big hit, especially in education. Apple Media Event viewers. Who knows why, but after a long streak of live-streaming every single Apple media event, this event wasn’t streamed live. (Instead, an archived video will be posted after the fact.) Suddenly we were all liveblogging like it was 2009, with word-for-word recaps instead of a little more restrained analysis. It was a fun throwback, don’t get me wrong, but I think I prefer the world where people who want to see the Apple event live can do so–and journalists in attendance can dial back the blow-by-blow depictions and instead insert a little more context and analysis. Schools with tight budgets. 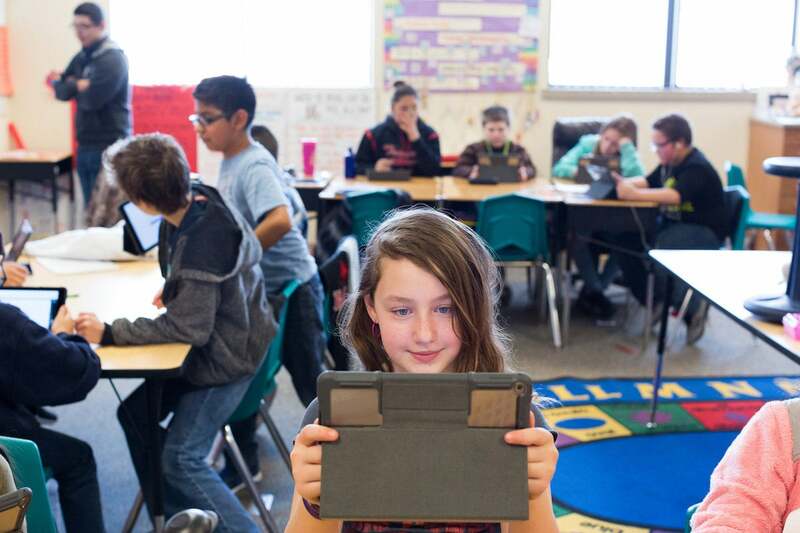 Google-powered Chromebooks are taking over the education market, thanks to Google’s excellent educational administration tools and the dirt-cheap prices of Chromebook laptops. Anyone hoping Apple would swoop in with an even lower priced iPad went home unhappy: The sixth-generation iPad costs the same as the fifth-generation model, and now Apple’s trying to sell schools Apple Pencils, too. 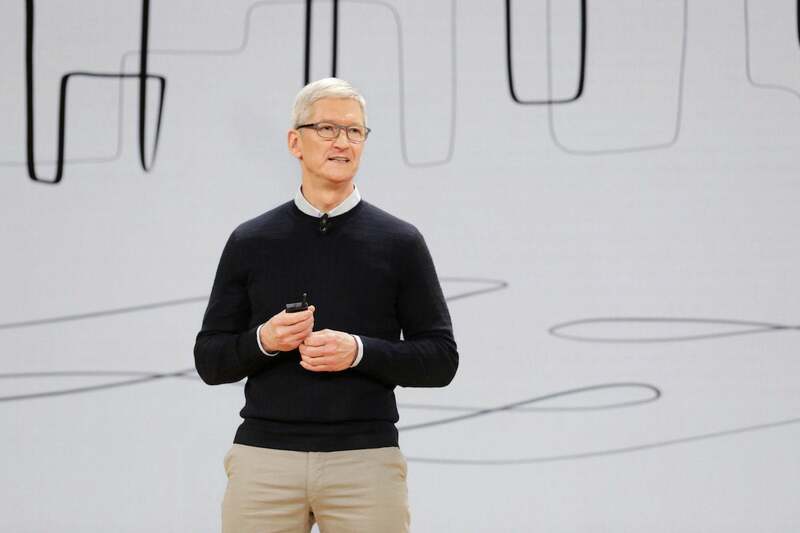 From Apple’s perspective, the entire day was about telling why Apple’s stuff is worth the extra money, as well as playing catch-up with some administrative tools and cloud storage quotas that lag well behind what Google offers to schools. It’s a work in progress, to be sure. The iPad Pro. When it was first released, the iPad Pro was differentiated from the iPad by its support for the Apple Pencil and the Smart Connector and Smart Keyboard. In its second generation, the iPad Pro has been given other boosts–a bigger screen on the 10.5-inch model, powerful processors, a wider color gamut–that further differentiate it from the plain ol’ iPad. But one of the ways the iPad Pro was different–if you wanted to use an Apple Pencil you had to buy one–is now gone. That will probably woo at least some people–the ones who really just want to use the Apple Pencil–over to the much cheaper iPad. It’s important to note, though, that we’re comparing 2018’s iPad to 2017’s iPad Pro. Presumably new iPad Pro models are on the horizon, possibly with smaller bezels, Face ID, faster processors, and who knows what else. It’s almost certain that the gap will widen again, but for now it’s a little bit closer. The Mac. There was a time when Apple’s entire education strategy was the Mac. That time was 1984 through 2010. But these days, the iPad is most definitely Apple’s story in education. I noticed two mentions of the Mac in Apple’s presentation, and they were telling. The first was when Apple put up a slide of software running on a Mac… only to wipe to a slide showing that now it ran on iOS too! 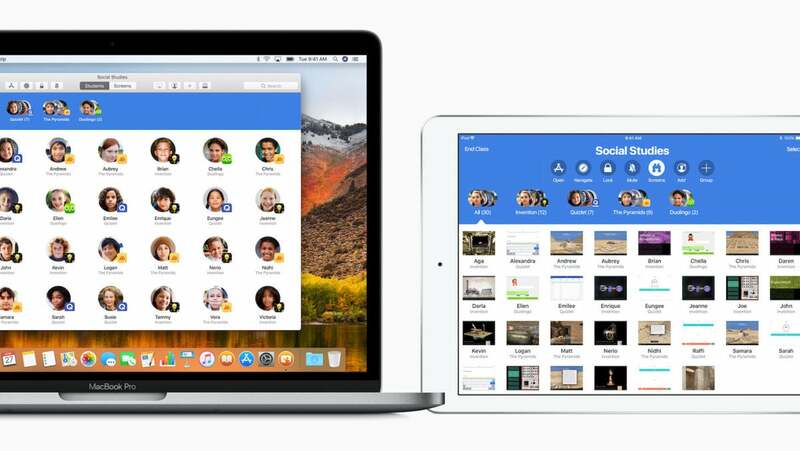 The second was the announcement that the iOS app Apple Classroom would be brought to the Mac, which was nice–but that’s an app for teachers. The context was clear: Mac support might be nice for teachers (because they’re older? ), but isn’t as necessary for students. Apple still professes its love of the Mac, and in certain areas in education it’s still powerful. In one of the demonstration classrooms at the school on Tuesday, above the many iPads showing off Swift Playgrounds and ARKit and other features, was a mezzanine full of iMacs, more than a dozen of them all in a row, presumably being used with Final Cut or Logic or other high-powered media applications. The area was darkened and roped off. The Mac still exists and still has some relevance, but at this event it was barely more than a footnote.